girafaeyes, originally uploaded by MissionMission. We hate to make it three graffiti posts in a row, but it just had to be done. We’ve been wanting to plug the new Girafa pool on Flickr, and the Milpitas Police Department has just provided ample reason. The San Jose Mercury News reports that, according to the fuzz, a recent spate of Girafa bombings in Milpitas is surely “gang related.” Bummer! 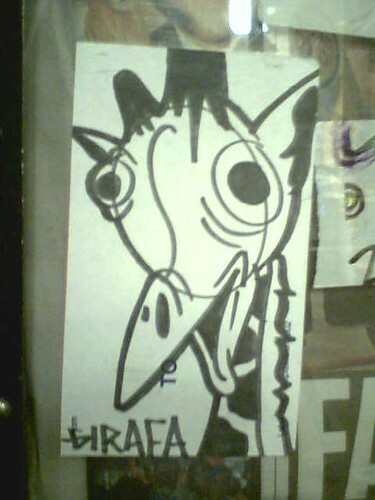 Clueless law enforcement aside, what up with Girafa anyway? Lovable new kid on the block, or heavy-handed Ribity wannabe? hipsterstencil, originally uploaded by MissionMission. Hmm. 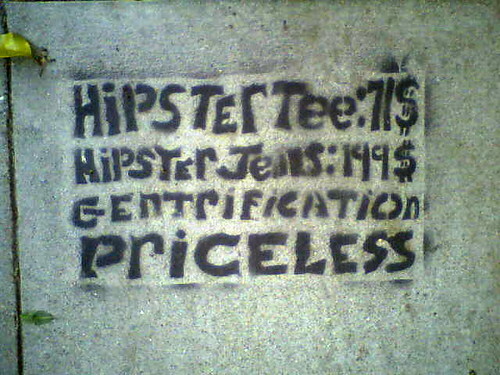 We might append this thing thusly: “Hipster Tee: $71 / Hipster Jeans: $199 / Hipster “Street Art” Stenciling Materials: $44 / Gentrification: Priceless.” Note that this was photographed in the Lower Haight, a neighborhood we love almost as much as the other one. Daniel totally makes our point. Who is this stencil writer so critical of “gentrification” anyway? Do they really think they themselves are not a HUGE part of the process? Would it even be tangible without the participation of “street artists” like them? Who do they think they’re fooling? plagueor, originally uploaded by MissionMission. 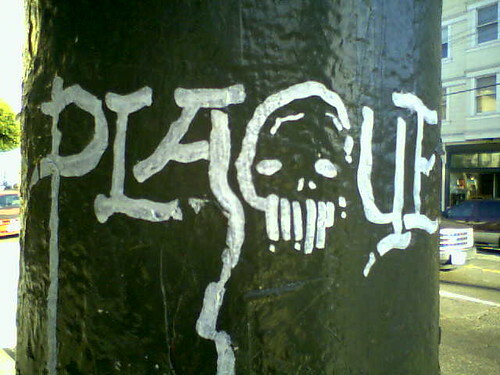 So, does this say “plague” or “plaque”? It works either way. On one hand, plagues produce disembodied skulls and stuff. On the other, this particular skull looks like it has plaque dripping from its teeth. Typographically speaking, it works both ways too. Any thoughts? Photographed on the northeast corner of 16th & Guerrero. 14X, originally uploaded by MissionMission. 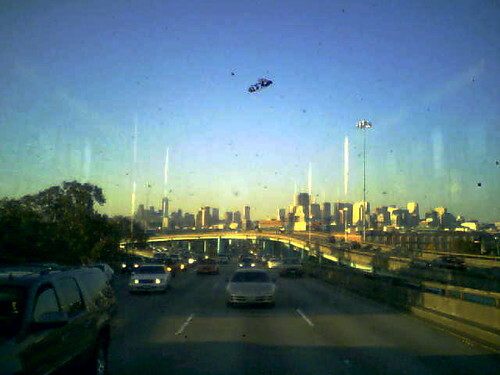 The other day we were heading back to the Mission from Downtown at rush hour, and we hopped on a 14X on a whim, not really knowing what the “X” meant. Turns out, the “X” means the bus bypasses the Mission District altogether, getting on the 101 South at 6th Street and not stopping until it’s halfway to Daly City. It was a fun ride though, what with the not wearing a seatbelt at 60 miles per hour and the views of the city and the sunset and everything. 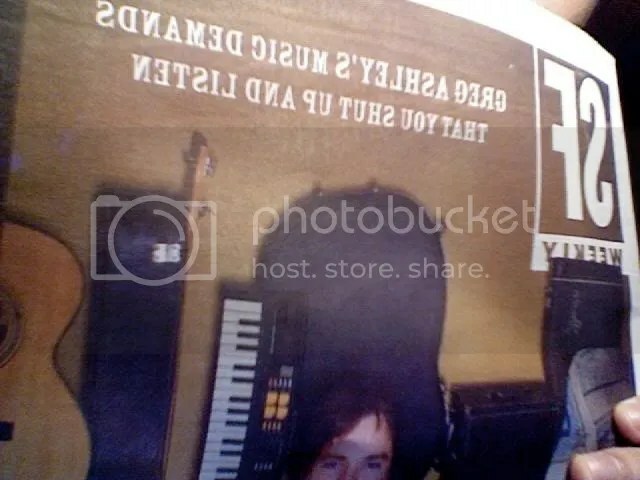 The cover story in last week’s SF Weekly (more like SF Weakly) proclaims that Greg Ashley’s music “demands that you shut up and listen.” So are we to infer from this that SF Weekly generally DOESN’T LISTEN to the music it writes about and reviews and claims to advocate? They have a “reviews” section every week, but are we to understand that this is the first time they’ve deigned to listen to something before writing it up? Here at Mission Mission, we tend to think the chief reason to put music on is to LISTEN to it. We LIKE listening to music. We don’t need someone to “demand” that we do it. 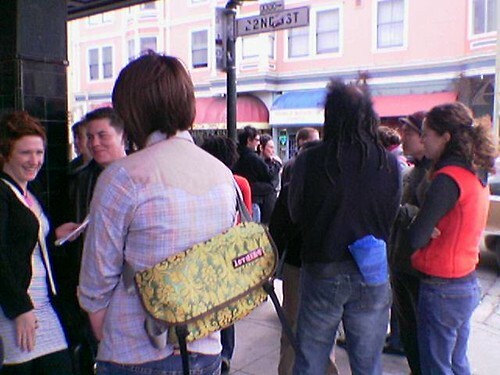 mission hipsters wait for brunch, originally uploaded by maximolly. So yeah, it’s douche deluxe, and you’ll likely want to murder a significant fraction of the clientele, but that’s a small price to pay considering there are actual “hot chicks” here.I mean, let’s get real. The other day I saw a pregnant woman at a bar in the Mission and absentmindedly (ok, “stonedly”) thought to myself, “Oh, that’s great. What a blessing.” Then I realized it was just a fat hipster. This very afternoon, I happened upon a young lady crossing 16th St. wearing some sort of brightly-colored prosthetic apparatus on what appeared to be her injured leg; closer inspection revealed that it was merely a garish leg-warmer of some sort. Seems like these days it’s the dope boho shizz to appear as though you have a serious health condition. I shall be teh PIMP HOTNESS of the Valencia St. corridor once my prosthetic goiter and sparkly colostomy bag arrive. I mean, we hate the Marina, and we have no real reason to side with this Jeff A. character, but his argument is kind of solid. walzwerk, originally uploaded by MissionMission. Taken in the urination station at Walzwerk.